Joel Feder April 9, 2017 Comment Now! After what seems like forever, it has finally happened: the quickest Jeep ever is here. The Hellcat-powered Jeep Grand Cherokee has arrived, ending one of the worst-kept secrets of all time. 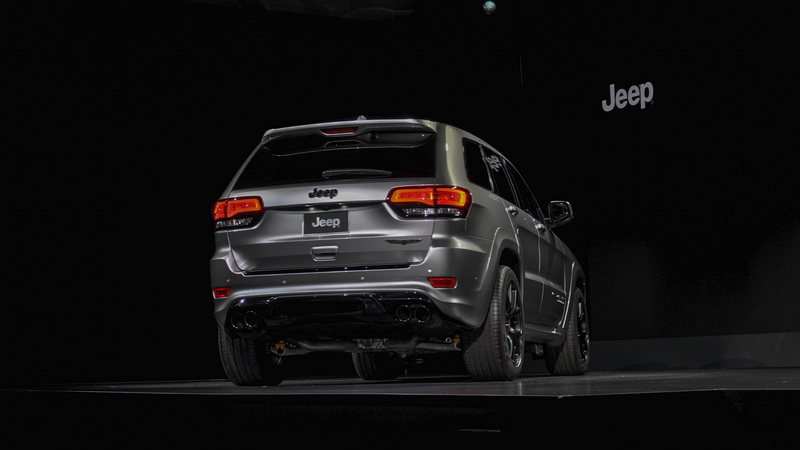 Making its formal debut this week at the New York auto show, the 2018 Jeep Grand Cherokee Trackhawk has plenty to boast about as it stakes its claim on the performance mountain. First and foremost, it has the full boat when it comes to power: yes, all 707 horsepower that the Challenger and Charger Hellcats have. 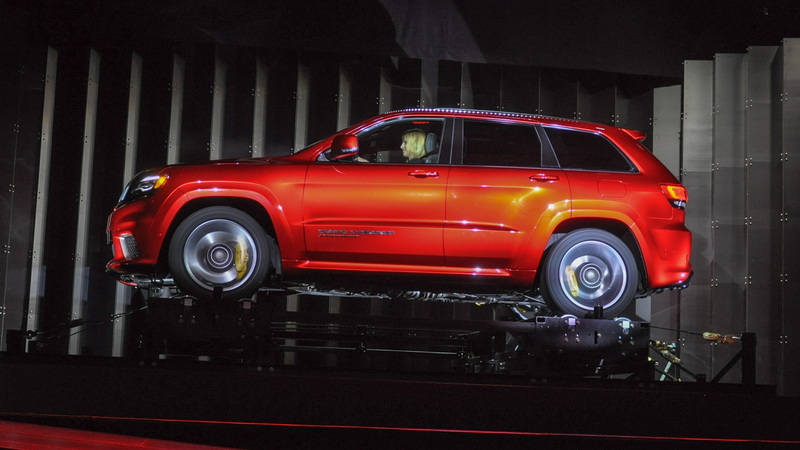 There was concern in the performance community that the supercharged 6.2-liter's power output would be neutered in the Grand Cherokee due to the all-wheel-drive system's strength, but Jeep overcame that concern by modifying the full-time active transfer case with forged steel chain sprockets and a wider chain. That transfer case is a single-speed active setup and there's an electronic limited-slip differential in the rear to help control the power. 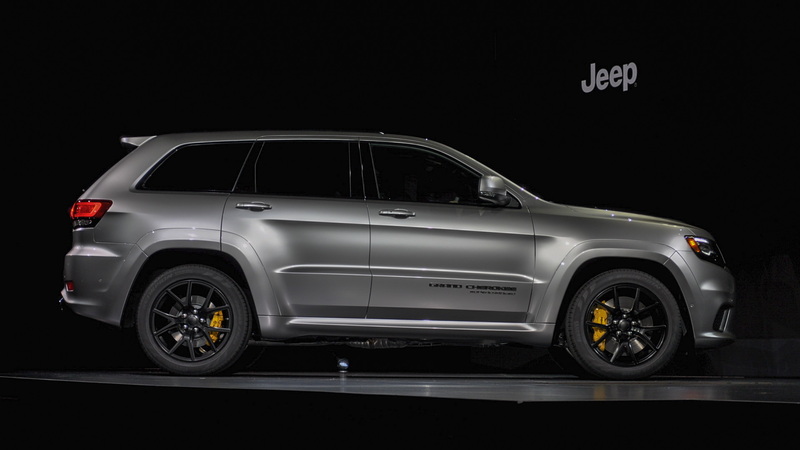 Jeep's touting the Grand Cherokee Trackhawk as the "most powerful" and "quickest SUV ever." With claims like 0-60 mph in just 3.5 seconds, a quarter mile time of 11.6 seconds, and a top speed of 180 mph, we aren't about to argue with them. Of course, to handle all this power and speed, the Grand Cherokee's brake system was upgraded heavily for Trackhawk duty. 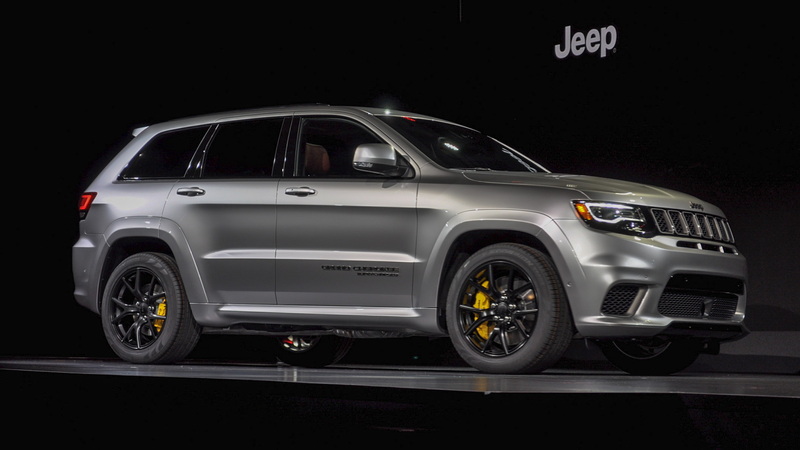 With 15.75-inch two-piece vented Brembo rotors up front clamped by 6-piston calipers plus 13.78-inch vented rotors in back, Jeep claims the Trackhawk can come to a standstill from 60 mph in just 114 feet. Many driveline components have been upgraded for Trackhawk duty, from the 8-speed automatic transmission being bolstered to a strengthened rear drive shaft and new, stronger rear axle. Like the Grand Cherokee SRT, the all-wheel-drive system has five modes—auto, sport, track, tow, and snow. Each modifies all-wheel-drive parameters plus transmission, paddle shifters, suspension, and electronic power steering programming. Worried about handing the keys to your Trackhawk over to a valet? Like most high-performance vehicles these days, there's a valet mode which limits nearly everything. From power to modified shift points, the Trackhawk basically turns into a V-6-level Grand Cherokee. While towing's not its main mission in life, the Trackhawk is capable of lugging up to 7,200 pounds. For those keeping track, that's exactly the same as the Grand Cherokee SRT and the regular Grand Cherokee with its optional 5.7-liter Hemi V-8 engine. 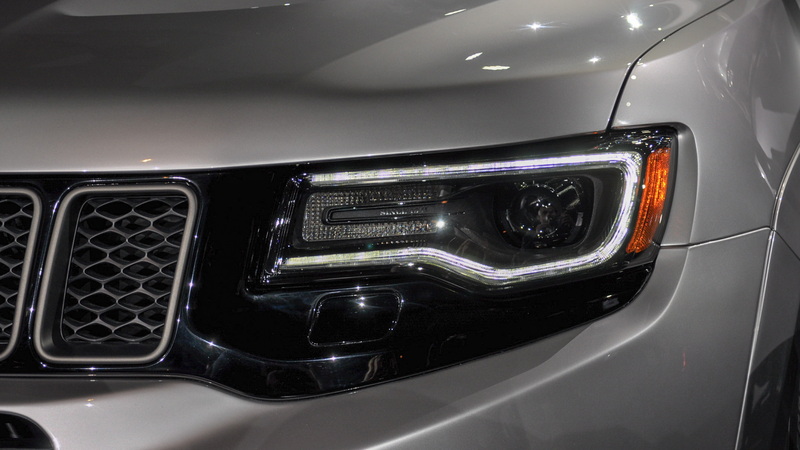 Visually the Grand Cherokee Trackhawk is what we expected. It's nearly identical to the Grand Cherokee SRT which was refreshed for 2017. Gone are the SRT's fog lights for better cooling, and out back there's a new quad exhaust setup that is sure to emit the sound of the devil. Filling the wheel wells are 20-inch alloy wheels with a square tire setup from Pirelli. The 3-season P Zero Scorpion Verde tires are Z-rated 295/45s. For those wanting to save a decent amount of weight, an optional lightweight 20-inch forged alloy wheel option will be available. Jeep says that they save 12 pounds per corner over the standard setup. Inside it's standard Grand Cherokee fare—albeit with some upgrades to remind drivers they're in a Trackhawk. There's now a 200-mph speedometer, Trackhawk-specific performance pages in the 8.4-inch Uconnect touchscreen infotainment system, and a three-spoke flat-bottom steering wheel with a Trackhawk logo on the bottom. The standard nappa leather seats feature a distinctive Trackhawk logo on the headrests and they can be outfitted in a model-exclusive black and Dark Ruby Red color scheme. Front and rear seats are heated and front seats get ventilation. Options are few, but they include a dual-pane panoramic sunroof, Dark Ruby Red seatbelts, a package that adds real metal accents inside, a dual-screen rear-seat entertainment center with a Blu-ray player, and an 825-watt Harmon Kardon 19-speaker sound system with two subwoofers. Like the rest of the 2018 Grand Cherokee lineup, the Trackhawk now includes standard Apple CarPlay and Android Auto embedded in the latest version of FCA's 8.4-inch Uconnect infotainment system. Despite having all the raw power in the world, the Trackhawk comes with a full setup of active safety tech: blind-spot monitors, adaptive cruise control, forward collision warning, and automatic emergency braking. The 2018 Jeep Grand Cherokee Trackhawk will begin tearing out of dealers in the fourth quarter of 2017.